Engineering PG Degree: Master of Engineering or Master of Science in Technology or Master of Technology or Master of Science in engineering degree is 02 years (2.5 years for M.Sc Engineering) degree program that is available to the candidates who want to get a post graduate degree in engineering after completing their 04 year B.Tech degree. PG Degree in engineering is totally based on technical research and practical implementation of book knowledge. The complete M.Tech Entrance exam calendar for the academic year 2017 is given below. The candidates who are looking for the PG admission after completing their B.Tech degree are invited to follow the complete procedure that is provided here for various Engineering PG Entrance Exams all across the country. 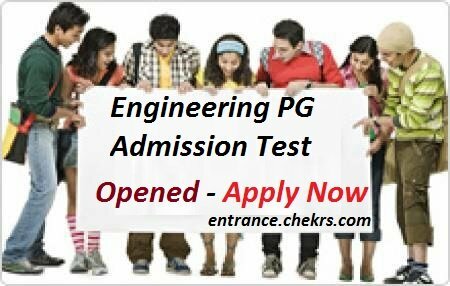 Normally the admissions in PG Engineering programs are carried out on the basis of marks scored in GATE. The List of various state level, national level, and university level Engineering PG Admission Exams with the complete details of application form submission dates, admit card releasing dates, Exam dates, etc. are provided below. The candidates, who are looking for the tips to qualify in M.Tech Admission Test 2017 are suggested to follow exam wise link given above, by following the link you will be able to access the shortcuts and exam qualifying tips from the experts who hold years of experience. You can contact us for any type of suggestions or advice by commenting at the end of the post. We will try our best to respond you as soon as possible with the most optimal solutions as soon as possible.